Glutathione is a powerful antioxidant and detoxifying compound consisting of three amino acids: cysteine, glutamic acid, and glycine. * Produced in the liver, glutathione assists with detoxifying, maintains the integrity of blood cells, and helps transport amino acids across cell membranes. It aids in the breakdown of oxidized fats and is necessary for carbohydrate metabolism. This hypoallergenic* formulation has been specifically designed using the active, reduced form of glutathione for maximum benefit. A legacy built on purity: Since 1969, the Klaire Labs name has been trusted to deliver clean formulations suitable for even the most sensitive individuals. Klaire Labs was among the first to provide pharmaceutical grade active ingredients formulated to minimize allergens, artificial additives, fillers, and flow agents. Features the active, reduced form of glutathione for maximum benefit. 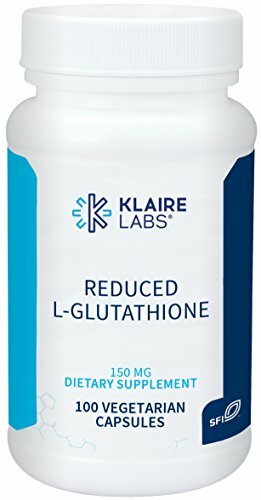 Supplies 150 mg of reduced L-glutathione per vegetarian capsule. If you have any questions about this product by Klaire Labs, contact us by completing and submitting the form below. If you are looking for a specif part number, please include it with your message.